Salman Khan turn fifty on 27 December 2015. Having made his film debut in 1988, he has found his place movies ranging from Maine Pyar Kiya and Hum Apke Hain Koun…! to the more recent Dabangg, Ek The Tiger, Kick and Bajrangi Bhaijaan to his credit. 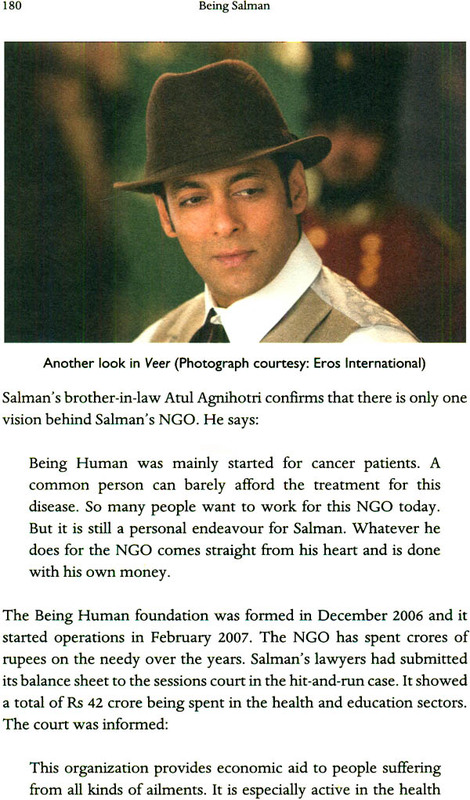 Well known for his magnanimity, Salman runs the non-profit charitable organization Being Human. Salman’s stint with controversies has been as long as his career. His personal life has often made headlines, what with his involvement in blackbuck poaching and a hit-and-run case. He has a reputation for getting hot under the collar and abusive when riled. These attributes have earned him the dubious title of ‘Bad Boy of Bollywood’. Who is the real Salman Khan? Why is he the way he is? This book delves into SAlman’s lineage and his personal history to reveal interesting vignettes and unknown facts about the enigmatic and immensely popular superstar, and will help his many fans understand what ‘Being Salman’ is all about. This book delves into Salman’s lineage and his personal history to reveal interesting vignettes and unknown facts about the enigmatic and immensely popular superstar, and will help his many fans understand what ‘being Salman’ is all about. Jasim Khan is a senior journalist and TV producer. In his fifteen-year-long career, he has been associate with many reputed news channels like Zee News, Aaj Tak and star New (now ABP New). Currently, he produce special shows as an associate executive producer for ABP News, Born and brought up in the Betul district of Madhya Pradesh, Jasim is based in Delhi NCR and can be reached khan.jasim@gmail.com. Stars rise and fade in the firmament of Hindi cinema, but the Khan trio-Aamir, shah rukh and Salman-have continued to dazzle Bollywood for the past quarter of a century. All three are contemporaries who entered the film industry at ju1st about the same time; all three were born in 1965 and turn fifty in 2015; and all three seem to defy to defy their age, with their star power only growing with their advancing years. There is no doubt that the Khans have redefined stardom in the world of Hindi cinema in the twenty-first century. 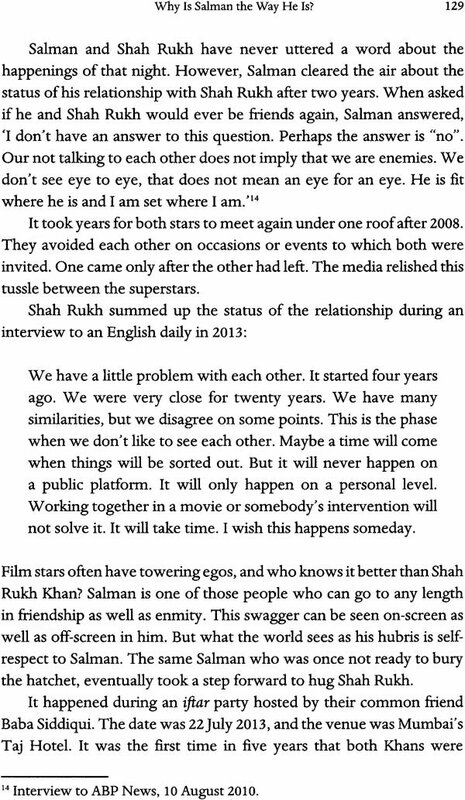 Few would deny that Salman Khan is the most controversial and talked-about actor among the three Khans. It will not be an exaggeration to say that he is perhaps the most notorious superstar of bollywood. Tales of estranged relationships and numerous legal entanglements have earned him the dubious title of Bollywood’s ‘bad boy’. 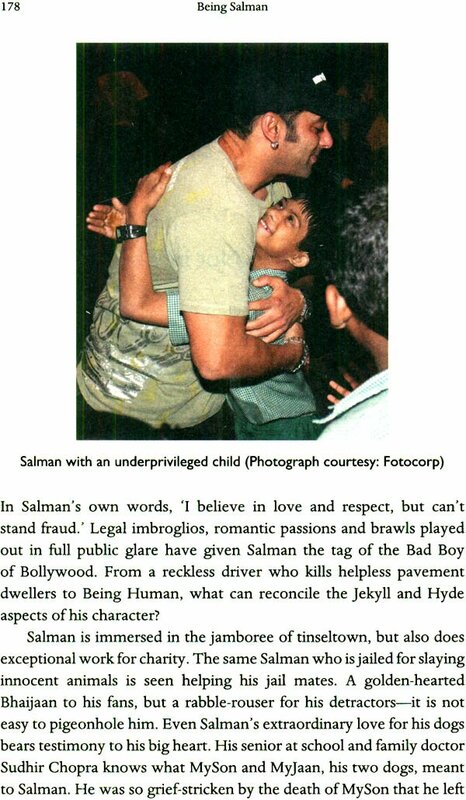 Before I started writing this book, my acquaintance with Salman Khan was based only on what the media dished out. I must onfess that I had limited knowledge about him, despite being a journalist. So why and how did I come to write this book? What makes this book special? Consider it my duty as a writer to answer these questions for y readers. The story begins in October 2012. It was just another day at work. A new assignment was waiting for me at the office. My boss wanted me to make a documentary on Salman Khan. I was on the job right away. After some initial research on Google, I boarded a flight to Mumbai. My colleagues at the Mumbai bureau of ABP New cautioned me that it would be difficult to persuade Salim Khan for an interview, let alone hope for a chat with the superstar himself. But my documentary would not be complete without a meeting with at least one of the two. It was during the same trip that I met film journalist Jaiprakash Chouksey. He asked me if I had talked to Salem sahib regarding the documentary. I answered in the negative. Insisting that I must interview him, he rang up Salim Khan. I don’t Know what transpired between them, but I was told to call Salim Khan after two days. Accordingly, I called him at 10 a.m. two days later to fix our meeting. ‘Who is it?’ inquired a stern voice from the other side. ‘Come after two days at 11 a.m. – I am not well today. But don’t forget to call before you come,’ said voice on the other side. Two days later, I was right on time at Salman Khan’s flat in Galaxy Apartments in Bandra, along with my camera unit. At first glance, the flat was a surprise. It was difficult to believe that one of Bollywood’s biggest stars lived in such a modest three-bedroom flat. We entered the drawing room and were taken to the balcony. It was the same place from where Salman is frequently spotted waving to his fans. Salim, Khan appeared from the drawing room after some time. ‘Arrey, I had called you a meeting and you arrived with the entire crew?’ he asked me after exchanging pleasantries. I proposed to interview him later if he was not in the mood. But he gave his consent and called for tea. Thus started my first found of conversations with him. Ruddy eyes and a resolute voice lend Salim Khan an emphatic presence. However, his friendly demeanour never let me feel that I was meeting him for first time. He was very polite despite being older, more experienced and accomplished. His way of speaking reflected his education as well as pedigree. Salim Khan was forthcoming on topics ranging from religion, politics, and social issues to cinema. He was frank in answering even the toughest of questions. When we were about to wrap the interview, he offered us food. ‘It is the custom of our family to never let a guest go hungry,’ he declared. We engaged in another chat after lunch. He came to see us off to the door as we left about 5 p.m. 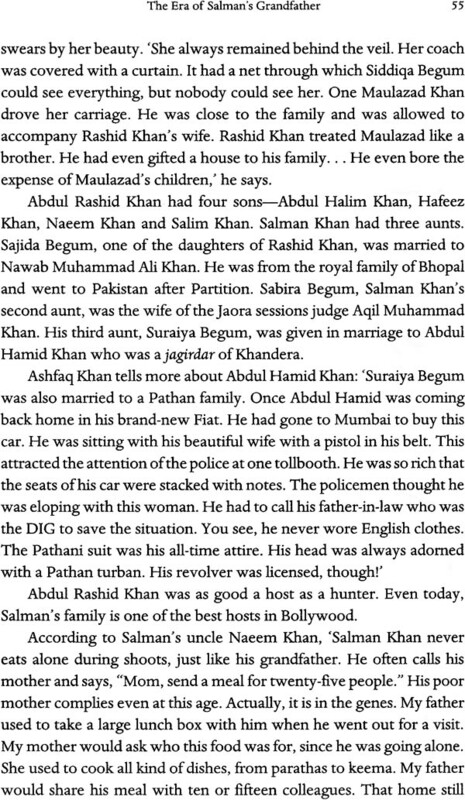 I have gone into such details about my first meeting with Salim Khan as it struck me them that the son of such an impressive man must also be like him. 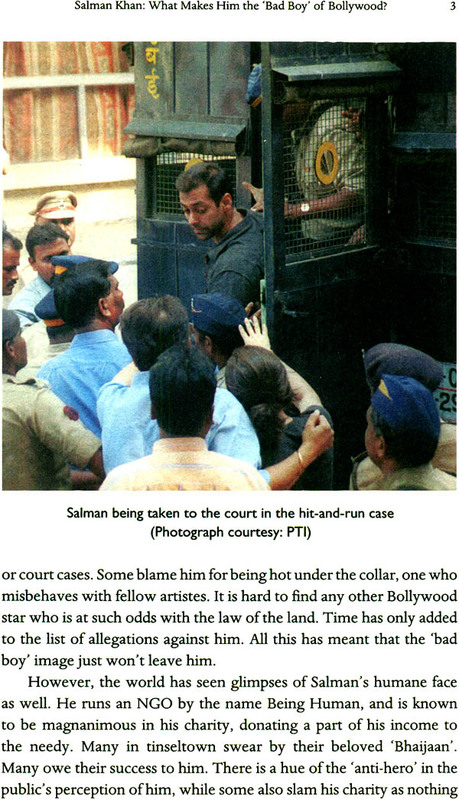 We hear all kinds of things about Salman Khan in the media, but the truth barely comes out. Few people know Salman personally. It makes his personality more enigmatic and lends him an aura, but it also became difficult to ascertain the truth about his nature. These thoughts hovered in my mind as I returned from Mumbai and got busy in the production of the documentary. One day I pointed out to ABP group editor Shazi Zaman that there was hardly any good book on Salman Khan. ‘Why don’t you write one/’ he quipped. The discussion ended there, but the idea stayed in my mind. Then one day Shazi called me and asked what had happened to the book. This prompted me to start serous work on the book that is now before you. 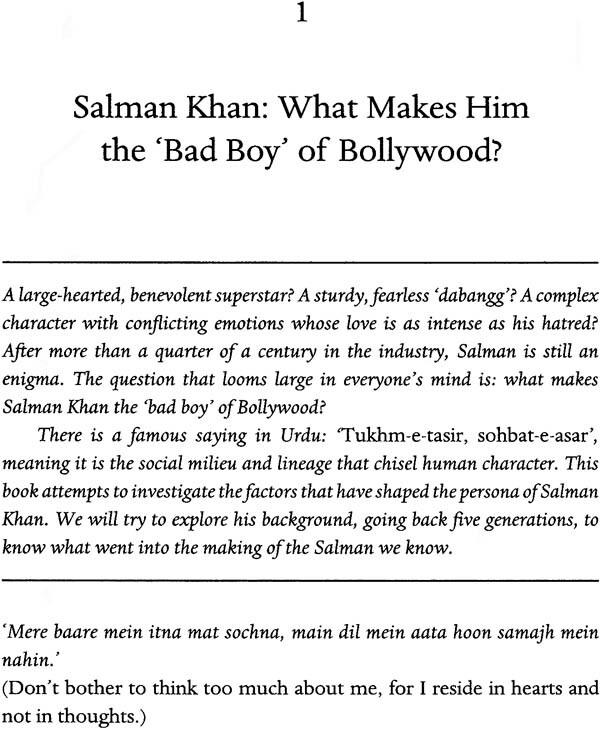 The central theme that lingered in my mind right from the inception of the book was: why is Salman Khan the way he is? I have undertaken a long journey of research to find a credible answer to that question. The outcome of my three years of labour is in your hands. My grandmother Sugra begum often cited old saying to me. She would emphasize the importance of good company by saying. ‘Tukhm-e-tasir, sohbat-e-asar.’ This old Urdu idiom means that it is the social milieu and lineage that chisel human character. This saying never faded from my memory and I have tried to evaluate the personality of Salman Khan based on its dictum. It has been my endeavour to look at his persona from every possible perspective, to see how his family lineage and his social circumstances shaped his character. I was always clear in my mind that judging Salman Khan from the controversies he had become embroiled in was not my quest. They aim of this book is to highlight the different facets of his personality. This book attempts to investigate the authenticity of incidents, argument and facts associated with Salman Khan. It also seeks to find answers to the questions raised by the media regarding him. It is, therefore, important to mention that this book does not merely document the superstar’s cinematic accomplishments, but ventures to shed light on Salman Khan’s psyche. This book is the result of a long journey of research. I have trod many roads in many cities during its course. I have moved from pillar to post in government and non-government museums of cities like Delhi, Jodhpur, Bhopal and Indore to gather facts about Salman Khan’s ancestry. I have met people along the way who have helped me in this project, sometimes selflessly. The exciting sojourn of my research work commenced from Indore. This city is the most important node in the story of Salman Khan. 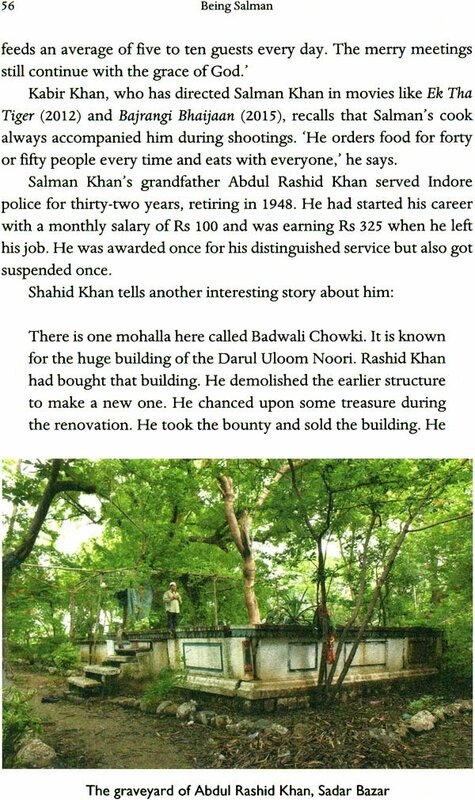 I went to several places in and around Indore that are closely related to Salman’s family history. The pursuit of Salman’s roots took me to all kinds of places, from a hospital to a graveyard and from lush green fields to ponds and well of the hinterland. I visited the schools and colleges where Salman as well as his father and grandfather studied. I tried to cover place that had some connection with studied. I tried to cover every place that had some connection with the superstar. Some dots were easy to connect along the way; others required a surprising stroke of luck. It took one year of effort for me to set foot inside Salman Khan’s ancestral home. 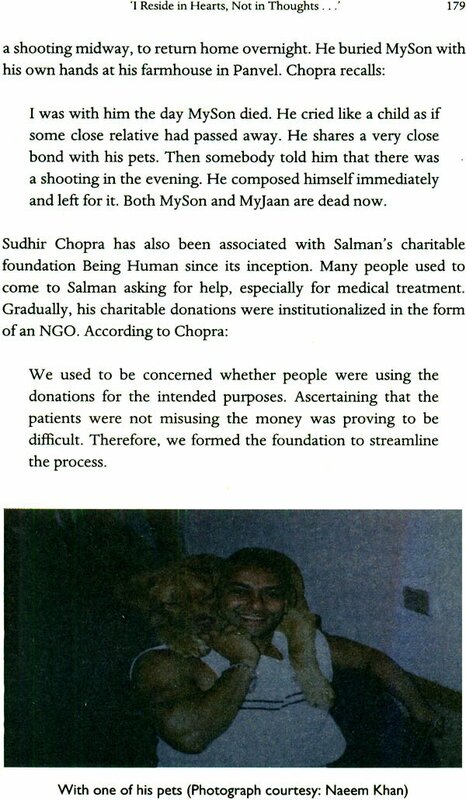 Here I found a vital source that revealed several hitherto-unknown and interesting facts about Salman. I was also able to find a 150-year-old grave where the where the spiritual master of Salman’s great-great-grandfather was laid to rest. I wandered in the villages and barren plains near Jodhpur to know the real fact behind the blackbuck poaching allegations against Salman. Elaborate eyewitness accounts and testimonies of other crucial persons associated with the case put the entire episode in perspective. 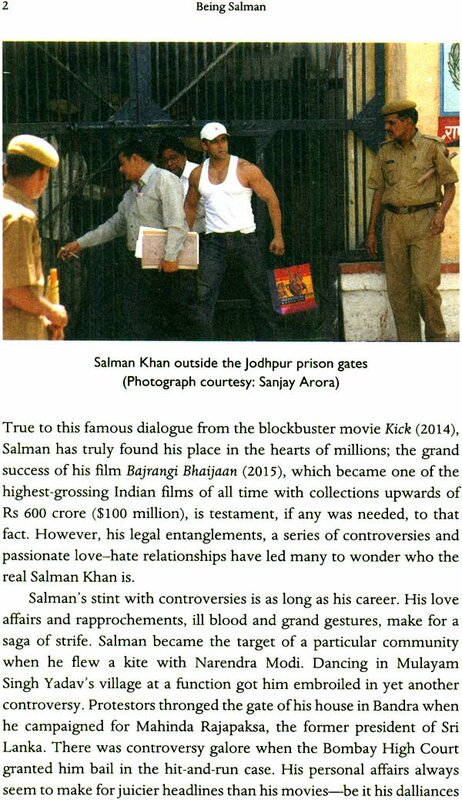 I also came across a person in Jodhpur who shared several personal experiences about Salman Khan’s real nature. 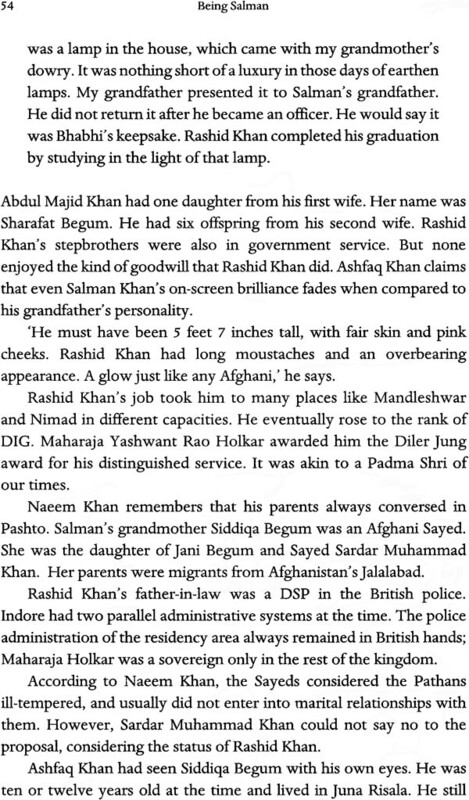 I believe I have put in a sincere effort to sum up all the aspects that define Salmn Khan. Still, the scope for improvement can never be denied, and all suggestions and honest criticism of my work will be moist welcome. 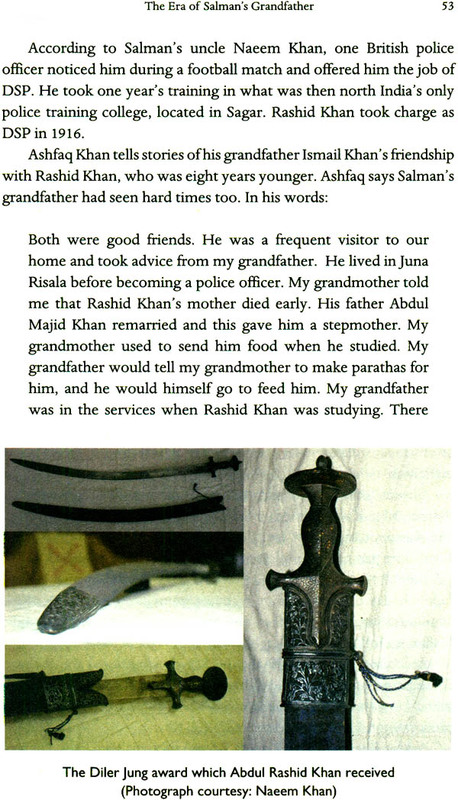 My heart fills with the memory of my beloved father, Abdul Wahid Khan, as I pen down this introduction. He always inspired me to give my heart out in every task. I wish he were in this world to see the fruit of my labour. This book would have made him proud.